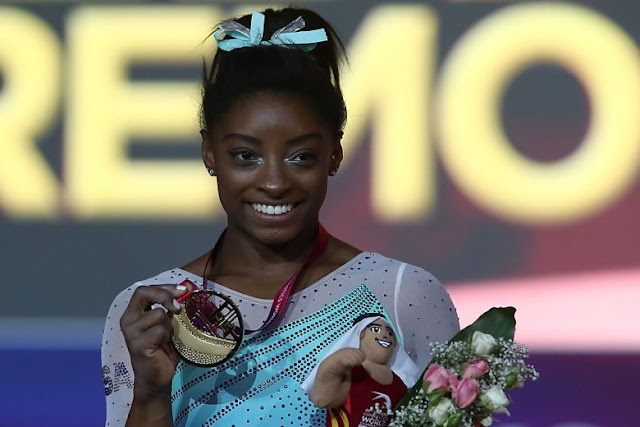 Superstar Simone Biles made yet more gymnastics history in Doha on Thursday when she became the first woman to win four individual all-around world titles, AFP reports. The unstoppable American won despite uncharacteristic errors in two of the disciplines, the vault and beam, to claim her 12th world title. It also means she remains on course this week to equal the record of 20 world championship medals set by Russia’s Svetlana Khorkina. The 22-year-old held off strong challenges from Japan’s Mai Murakami who took silver and American compatriot, and 2017 champion, Morgan Hurd. Biles finished on 57.491 points, almost two points clear of Murakami on 55.798. Hurd was edged into bronze on 55.732 points. Biles did not dominate as many anticipated. She trailed after her first piece of apparatus, the vault, and also struggled on the beam where she came off. Despite that her winning margin of 1.693 is the largest of her titles. Also going close to a medal were Belgium’s Nina Derwael and Russia’s Angelina Melnikova. At one point Derwael headed the competition and looked certain to claim a medal but was outdone by superlative final performances by the top three. Emphasising how close the competition was there was just 0.001 points between fourth and fifth places. The gymnasts perform on four pieces of apparatus, vault, beam, uneven bars and floor.